Earlier today, we reported that Catalist and NGP VAN were named as respondents in a campaign finance complaint alleging that Democratic campaigns benefited from these two organizations that charged their clients below-market rates. The campaign finance violation specifically named all of the federal candidates in Colorado in 2014 – Mark Udall (U.S. Senate), Abel Tapia (CD3), Diana Degette (CD1), Jared Polis (CD2), Irv Halter (CD5), Rep. Ed Perlmutter (CD7), and Andrew Romanoff (CD6). 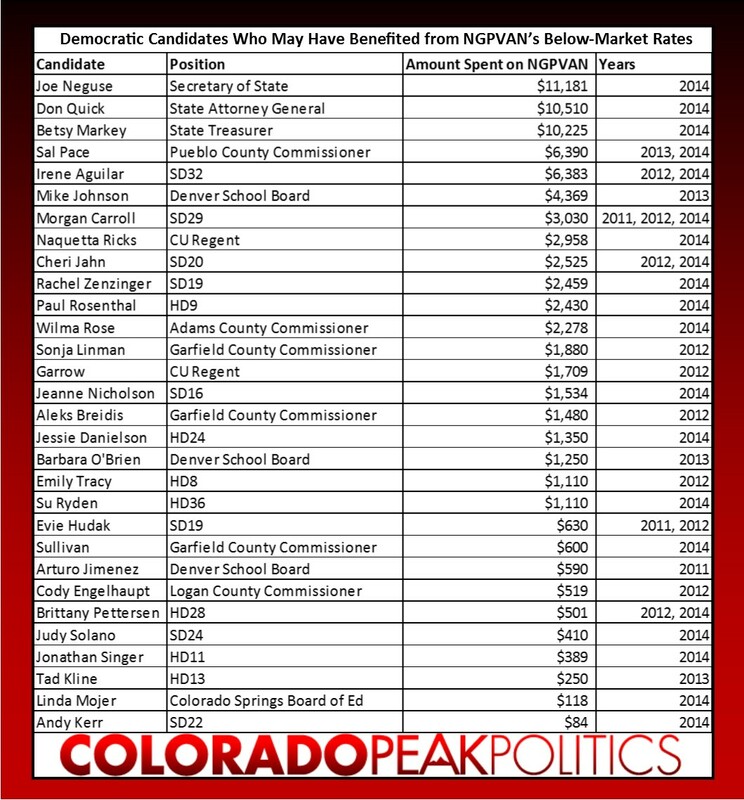 But, Colorado’s state-level candidates also may have benefited from this bargain basement arrangement, as NGP VAN is one of the largest vendors to Colorado’s Democratic candidates, having received $168,889 in business since 2011. It could be as high as $325,000 if one counts NGP before its merger with VAN in 2010. Of course, since NGP VAN may have been charging below market rates for its services, these numbers may be far lower than the actual amount of services provided. Nonetheless, there are a few interesting observations (before we get to naming names and pointing fingers). NGP VAN’s presence has grown each year in Colorado. Here’s the spending by year: 2011 ($4,738), 2012 ($24,292), 2013 ($52,146), and 2014 ($82,712). This is just the spending that we can track in TRACER at the state level. There may be others in committees with fewer reporting requirements. On November 14, 2103, Catalist announced a major investment of $2.25 million from liberal financier George Soros. A few months later, Catalist and NGP VAN announced a partnership on behalf of the National Education Association (read: National Teachers Union). NGP VAN’s business in Colorado very quickly accelerated following the Soros investment. From February 14, 2011 through November 14, 2013, NGP VAN was paid $75,982 for this near-three year period. From November 14, 2013 through the end of 2014 (just over one year), NGP VAN was paid $85,656. Is the acceleration in spending a direct result of Soros investment (read: is this sort of close to the money laundering the complaint references?) in its partner? Who knows, but it’s a trend worth pointing out. So, now for the good stuff – which candidates, parties, ballot initiatives, and hateful committees benefited from NGP VAN’s potentially below-market rates? We’d like to point out the most absurd charge of this entire episode which was a $5 “consulting and professional services” charge. We can’t think of a service for $5 from a political consultant. Can you?